Creating high-quality video content can be a challenge. Videography or even video editing is not as common a skill as blog writing, and video is more expensive to outsource than photographs and images. As a result, many companies without access to large video budgets tend to shy away from using video as a part of their business. If they do resist video, then they are missing out on a massive opportunity and opening the door to their competition. Trends are leaning heavily towards a preference for video online. YouTube, the dominant video platform online, has 1.5 billion viewers every month. Research suggests that many of them are influential business executives looking for work related content. YouTube is now the second largest search engine in the world, and successful businesses are being discovered by a highly engaged audience. Many people seek out videos to help them find solutions to work related challenges. If you aren’t there competing for those views by helping them solve their problems, then other businesses in your space will surely be there to lend a hand and scoop up new customers as a result. The good news is that your videos do not need Hollywood level production. It simply needs to add value. Simple testimonials, whiteboard sessions, or screen capture videos can be all that is required to help someone who is doing research on a given subject. All that is required is some affordable editing software, and potentially a camera. If you aren’t leveraging video, then you can (and should) start now. Given the level of competition in most markets, and the preference for video among internet users, there can be serious detrimental effects to your business that you don’t yet realize. Videos have a remarkable impact on conversion rates online. Even the word ‘video’ can have a magical effect. If you are an email marketer or sales rep, then you could experience 5x higher open rates by including video, and better conversions across the board. If you have no video to use, then you are missing out on valuable email engagement from your potential customers. Similar trends can be seen from conversion rates on sales pages that include video vs simple text. It is the job of every business to fight for as much awareness and engagement as possible. We need customers and potential customers to understand why they should trust our service. But what happens when you actually get that person’s attention? Is it resonating? In addition to video having greater success with its calls to action, research shows that a video is more memorable. People remember 80% of what they see, and only 20% of what they read. People are seeking out a video as their preferred medium more and more often. If given the choice between text and video, most people will opt towards the video. This is about more than just delivering a great customer experience. It means that if you are not using video, you might lose the attention of the people who you need to hear your message. Today 59% of decision makers report that they prefer to consume content through video. If your competitor shares their sales pitch with a video, and yours is trapped in the text, you are at a demonstrable disadvantage. One of the great gifts that videos can provide is quick answers to complicated questions. Rather than rely on written FAQs, why not make a simple video that will provide the answer in an engaging format? If you aren’t using video, then your support team is probably larger and busier than it needs to be. Addressing questions, and showing off tutorials with online video can deliver great service without anyone needing to answer a phone call. Every company wants the free publicity and web traffic that comes along with social shares of their content. While getting shares is tough, it is significantly tougher if you never have videos that people are excited to share. One study on Facebook discovered that videos were 7x more likely to be shared than basic links, regardless of the subject matter. If you want to tap into a wider social network, but aren’t creating any video, then you could be missing out on a lot of exposure. 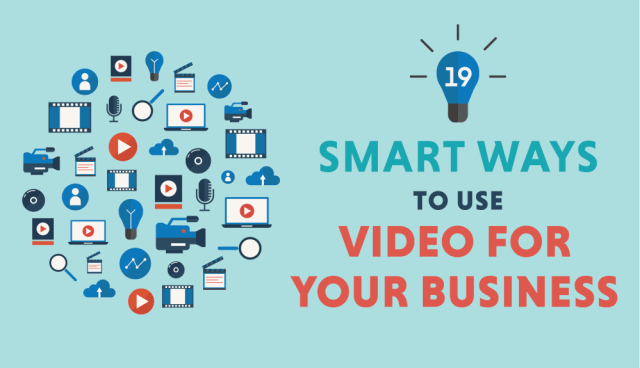 If you are ready to using video and gain the competitive advantages that come with it, you can tap into these 19 effective ways to use video in your business. Mike Barrett is the founder of Vlogging Guides, a resource site that is helping Marketers, YouTubers, and Small Businesses to build their own audience.